LEGO Classic Rainbow Fun Building Kit (85 Piece) - DEAL! In Stock NOW! 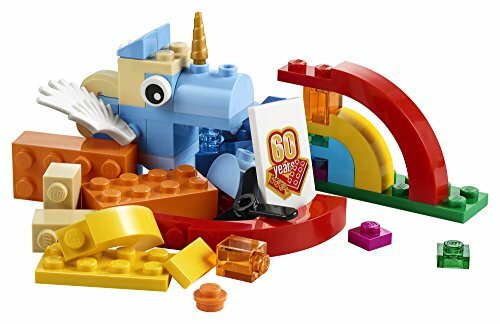 LEGO Classic Rainbow Fun Building Kit (85 Piece) – $4.97! In honor of the LEGO 60th anniversary, there are some new LEGO Classic Building Sets available!! They sell out quickly – but this one is in stock now!! Hurry and get the LEGO Classic Rainbow Fun 10401 Building Kit (85 Piece) today for only $4.97 from Amazon! Limit 2. I love that this one has pieces to make a unicorn, a rainbow and a plane!! Check out all of the recent Amazon deals here! Start building bigger thinking with Lego bricks! Help your child think bigger, build bigger and use their creativity with this rainbow-inspired special edition LEGO set, featuring a range of colorful bricks and elements, plus a unique 60th anniversary LEGO tile. No matter how big a child’s imagination is, expand it with LEGO bricks. This building toy offers varying levels of building complexity, and makes an excellent starter set for budding LEGO builders. What will your big thinker build?. Buy the LEGO Classic Rainbow Fun 10401 Building Kit (85 Piece) from Amazon. Next articleIdeal Hot Potato Electronic Musical Passing Game – 50% Off!